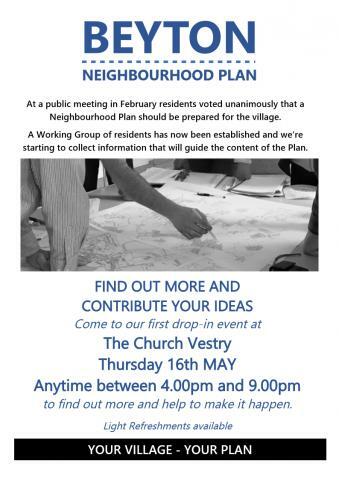 Agenda for PC Mtg 8 Apr added; BVN Apr-May added; N'hood Plan 'Call for Sites for Housing' added. This website for Beyton Village, run by the Parish Council, is now firmly established. Details are up to date from 1 January 2016 and additional information is being added regularly. The site covers the work of the Parish Council and provides general information about village activities and matters that affect parishioners. Contributions are very welcome, please use the Contact Us facility on the menu above. Local organisations are encouraged to take up the offer of their own section where they can manage their own content. Click on 'Clubs etc' above to learn more. For a summary of recent additions see the News column to the left or click on News in the menu above for a longer listing. Please explore the content currently on offer and come back regularly to keep in touch with village matters. Thank you for visiting.